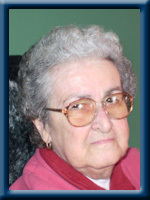 LOHNES – Bertha “Betty” L., 78, of Liverpool, passed away peacefully on Thursday, April 28th, 2011 in Queens General Hospital, Liverpool. Betty was a former employee with R. H, Davidson Stationery and also the Liverpool Flower Shop. She was a member of Pinehurst Rebekah Lodge #95, Liverpool, Ladies Auxiliary of Mersey Branch #38, Royal Canadian Legion, Liverpool and the Fish and Game Association. Betty was also predeceased by her husband Graham “Gay”; an infant daughter Charlotte. Cremation has taken place under the direction of Chandlers’ Funeral Home, Liverpool. A graveside memorial service was held Sunday, May 1st, 2011 at 4:00 p.m. in Liverpool United Baptist Cemetery. Reverend Steven Hopper officiating. No flowers by request, donations may be made to the Multiple Sclerosis Society or the Canadian Cancer Society. Online condolences may be made to www.chandlersfuneral.com. To the Family,Was shocked to hear of Bettys passing,spent many visits with Betty for her Home care ,Always enjoyed our little times,Betty was a special lady,She will sure be missed..May God be with you all…. I too was shocked with Bettys passing. I always enjoyed our visits and always left laughing. I’m sure shes glad to be with her husband now. My sincere sympathies to all. I also spent time with Bette, through Home Support, she was so appreciative of our organization, she will be greatly missed by many. I am very sorry for your loss. Betty will be missed. She was a lovely lady who had a great sense of humor. She is now with her husband who she missed terribly. Rest in peace Betty. You may be gone from this earth but you will not be forgotten. I am very sorry to hear of Betty’s passing. We always had good visits. She will be missed, but not forgotten. I did not know Betty all that long, but in that short time she became a friend to me, and I will dearly miss visiting with her. So sorry to hear of your loss. Rest in Peace Betty. I was shocked to hear of Bettys passing as well. Going to Bettys was one of my favorite places because I always felt welcome and appreciated. I too always left laughing about something. May you now rest in peace Betty. Our thoughts and prayers are with you all in your time of sorrow. Dear Kathy I am so sorry to hear of your mother’s death..Take care and I am thinking of you. I am so sorry to hear of Betty’s passing. We were able to spend some time together over the past year or so. Will always remember our times together at The Flower Shop. My sincere condolences to you and your family. We are sorry to hear of your mother’s recent passing. We have fond memories of “Black Bertha’s” dry sense of humour.Our thoughts are with you at this difficult time. I am so sorry to hear of your Mom’s passing. We had a good many chats over the years. Even though I have not seen you for a good many years, I have often thought of you and our times in High School. My thoughts and prayers are with you and your family at this most difficut time. I’m very sorry to hear that Betty is no longer with us. I got to know Betty this year, and even though it was only for a short time, she made a great impact on me. She was always honest and always had something funny to say. She will be remembered and greatly missed. Kathy i am so very sorry for your loss..I have very fond memorys of all our times togeather..Thinking of you at this sad time in your life..Lynda. Dear Cathy: I am shocked to read of your mom’s passing. I was just in visiting her a couple of weeks ago and she was so bright and looked like her old self. I am truly sorry. She loved you dearly. Remember her great smile and all the special moments you both shared. She will be missed. We send our sincere condolences to you all in your time of sorrow. I am so very sorry to hear about your Mom’s passing. I always enjoyed my visits with her . She taught me how to shell and clean lobster, and of course she never let me forget that !! I will never forget her and miss her dearly!! May she rest in peace now with her dear husband “Gay”. God Bless!